Amy Stewart, author of Wicked Plants: The Weed That Killed Lincoln’s Mother & Other Botanical Atrocities (which I plan to purchase as soon as I finish this post) is living my dream. 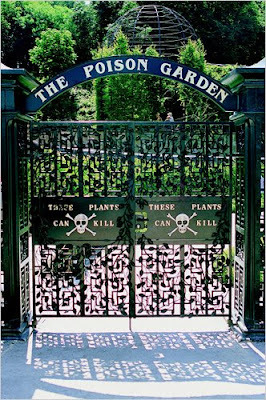 In a plot of ground behind her house in California, she's growing her very own Poison Garden filled with killer plants such as hemlock, foxglove, jimson weed, and castor beans. She's even decorated her garden with tombstones, skulls, and half-buried books. I'm so jealous I could spit. But at least I can visit the Stewart-inspired “Wicked Plants” exhibition that's coming soon to the Brooklyn Botanic Garden. I'll try not to nibble anything while I'm there. Read more (and take a peek at Amy Stewart's garden) here. It's a very commonly found spice. Most people have it in in thier kitchen. Weird, since in large amounts it can cause convulsions, nausea, and dehydration, don't you think? ...and looks like any other part of a good salad. that is amazing! Why didn't I think of that?? PS: Another Knitta is coming. I haven't decided where yet, but it's finished. that's is....well...... AWESOME!!!! so cool, but i am not sure my mom would be happy with poisonous plants mixed in with our watermelons and mint leaves... oh well! I just reread Hawthorne's short story Rappaccini's Daughter and the setting is a very atmospheric poisonous garden. Awesome! That's actually kind of really cool. Liltomboyblue: Thanks for showing off your Irregulars shirt in the great city of Asheville! That's so cool! I bet it's illegal in my city, along with chickens and sparklers and grass over 8". Hazel: Why would they outlaw tall grass? It makes a house look mysterious and sad. On the subject of dangerous plants, did you know that a lot of people think mushrooms are plants? And wow, there are a lot of poisonous mushrooms. That is really cool in a creepy way! Omigosh! I want one!!! Can you imagine how cool that would be to go outside and read, like, dracula in your own "Garden of Death"??!! P.S. i agree, never had a mushroom, never will, although my dad loves them! Is THIS the Most Famous Fake of All Time?